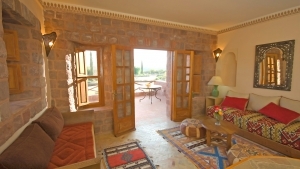 The Angour Deluxe Suite is named after Mount Angour to the south of the Kasbah. 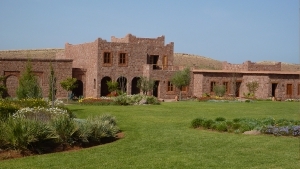 It is located on the first floor in the central tower and has an entrance hall, bedroom, bathroom and a Moroccan salon. 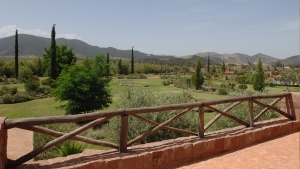 The spacious bedroom (21.6m²) looks due south across the gardens to the summits of the mountains. There is a large bathroom (8.5m²) which is separated into two parts: double wash basins and bath; and toilet, bidet and “walk in“ shower. The comfortable Moroccan salon (25.1m²) has views to the south and east. It incorporates a very attractive bar with sink and fridge. There is a large private terrace (22m²) adjoining the salon, with wonderful panoramic views. Our beds can be made up as one king size double or two singles. For families, the Moroccan salon in Angour Deluxe Suite can be adapated into two extra beds. 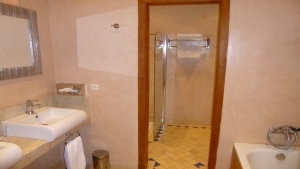 The price of the Angour Deluxe Suite varies according to the time of year. See Room Rates. The spacious bedroom (21.6 sq m) looks due south across the gardens to the summits of the mountains. There is a large bathroom (8.5 sq m) which is separated into two parts: double wash basins and bath; and toilet, bidet and “walk in“ shower. The comfortable Moroccan salon (25.1 sq m) has views to the south and east. It incorporates a very attractive bar with sink and fridge. There is a large terrace (22 sq m) adjoining the salon, with wonderful panoramic views. The price of the Angour Deluxe Suite varies according to the number of nights and the time of year. See Room Rates. You can check availability and book by selecting Online Reservation. To ask questions, please send an email to contact@kasbahangour.com .